London's oldest Botanic Garden opens its doors once again for the annual Chelsea Physic Garden Christmas Fair on the last weekend of November. Held in large heated marquees in the grounds, the stalls hold an extensive range of gifts, including garden paraphernalia, unusual jewellery, cashmere clothing, pottery, ceramics, woollen goods, handmade chocolates, children's clothes and exclusive leather goods. The Garden's Tangerine Dream Cafe will serve hot breakfasts and lunches (including a trademark game stew) as well as festive treats such as mince pies and mulled wine. You can also put in orders for special Christmas cakes and pies, to be delivered to your homes in time for Christmas. As well as the marvellous market, the Christmas Fair offers the public the chance to enjoy what is arguably London's most interesting private garden. Hidden behind towering brick walls and protected from the city's sounds and harsh breezes, the Chelsea Physic Garden is a truly breathtaking spot where the most idyllic collection of plants flourish in a unique, carefully created microclimate. A visit here before Christmas is a present in itself. 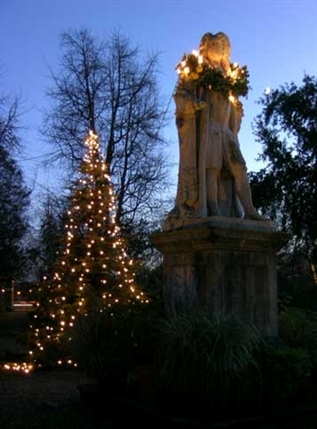 What are the best dining options near Chelsea Physic Garden Christmas Fair London? Chelsea Physic Garden Christmas Fair gyms, sporting activities, health & beauty and fitness. The best pubs near London Chelsea Physic Garden Christmas Fair. Chelsea Physic Garden Christmas Fair clubs, bars, cabaret nights, casinos and interesting nightlife. Where to have your meeting, conference, exhibition, private dining or training course near Chelsea Physic Garden Christmas Fair. From cheap budget hotels to luxury 5 star hotels see our special offers for Chelsea Physic Garden hotels, including Draycott Hotel London from 76% off.